I am 88 years old, and I will continue to accept the challenge of feeding more and more people every year. On December 12, 2012, at age 82, Jim Boulet donated 913 pounds of fresh turnips to Second Harvest Food Bank. It was his first harvest dedicated to the organization. Since then, he has donated over 330,000 pounds of fresh produce to Second Harvest to help feed people in need. 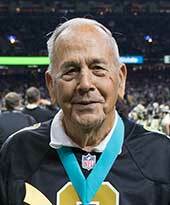 Jim was honored during the New Orleans Saints​ home game on December 17. It seems Jim’s entire life has been an evolution toward this point of giving. He’s owned businesses all his life, working alongside his family. He was a sugar farmer. He converted his fields to grow crawfish (for export to eastern Europe and Asia). He was a shrimper. A traveler. He and his wife brought their kids on the shrimp boat to see the Atlantic so they could experience other places, other people. They crossed through the Panama Canal to see the Pacific. He’s constantly learning. With a lifetime of broadening his own horizons and those of his children through education – whether formal or by just paying attention to life – Jim recognized that he had the opportunity, the ability, the expertise, and the financial security to help countless less fortunate others. What’s more, Jim’s driven by the conviction that if you can help someone in need; you do it. So he does. He harnesses his experience to help others, and that is the mark of a true champion. Jim Boulet … Peoples Health Champion. Visit no-hunger.org for more information about Second Harvest Food Bank.